Minnesota Dynamo Black poses with its silver trophy after going 4-1 at the national tournament. Photo courtesy of MN Dynamo Black. Mackenzie Miller’s nerves clicked into high-gear as dawn approached at the Minneapolis-St. Paul International Airport. Miller sat uncomfortably at Gate E12, waiting for or a flight bound for Cleveland, twiddling a dry-erase marker in her fingers and sharing muted conversation with assistant coach Kara Cole. “I travel with my whiteboard, so we were sitting at the gate just drawing stuff up,” Miller said over the phone on Tuesday afternoon, now slightly more than two days removed from a marathon hockey weekend in the city with a flammable river. 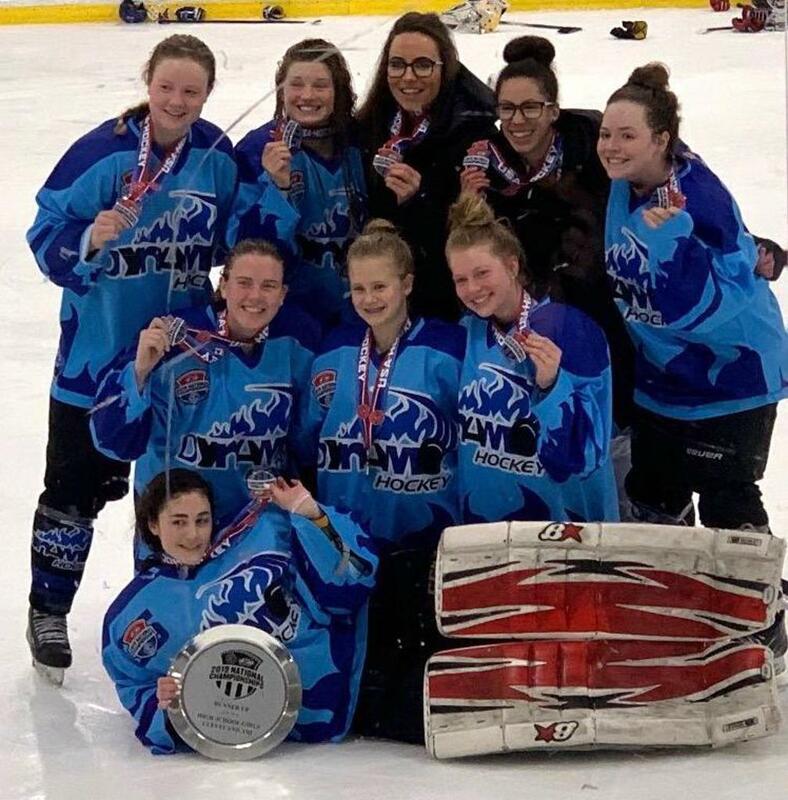 There were no grandiose plans of complicated offensive schemes for Miller’s second trip to the USA Hockey Girls High School National Championships on that Wednesday morning. There was no talk of how the goaltender rotation would shake out, our how to stagger the defensive pairs for special teams situations. Position rotations? Passive defensive play even without someone in the penalty box? These concepts did little to ease Miller’s anxiety. With Miller’s worries alleviated, her attention turned to the ice, where her five skaters and a single goaltender began what would turn out to be a five-game odyssey. Read that again. Five skaters with one alternate, and one netminder. For a national tournament. An unfortunate combination of spring breaks and class trips handicapped the Minnesota representatives in Cleveland, with approximately 11 skaters and a second goaltender being unable to make the trip. “We knew right away this was the situation we were going to be in,” Miller said, outlining the summer tryout and fall game schedule that Minnesota Dynamo Black follows, and how it meshes with the schedule release for the national tournaments and the already-set spring breaks for respective schools. Minnesota Dynamo Black celebrates during last weekend's Girls High School National Tournament in Cleveland. Photo courtesy of Lauren Rokala. Those curious supporters who wanted to see the team that actually showed up with six skaters and a goalie were treated to a display of pure guts, as the Minnesota girls won their first four games, downing teams from Anchorage (twice), Colorado, Montana, and Texas. “Knowing that yeah, we’re gonna have six (skaters) we’re obviously going to be at a disadvantage here, but we’re all Minnesota girls, and we can all do something,” Rokala said. The senior who skated for North Wright County during the high school season recorded six points during the five games in Cleveland and will continue her playing career at Nichols College in Massachusetts next year. Centennial senior Mackenna Stoterau played every minute of the weekend for Minnesota Dynamo Black, and her competitive nature did not allow her to heed a coach’s plea for a less active style of play. Unlike some of her teammates, playing every minute of every game is nothing new for Stoterau. “Growing up when I was in youth hockey, most of the time I was on the ‘B’ team, so I was usually the only goalie,” Stoterau said, adding that her frenetic energy between the pipes is for both her teammates’ and her own benefit. Minnesota Dynamo Black, in its entirety. Photo courtesy of Mackenzie Miller. With a 4-0 record, Minnesota advanced to the national finals for a chance to repeat as champions before running into the buzzsaw Team Texas and its half-dozen players committed to Division I programs. The Minnesotans had edged Team Texas 3-2 on Saturday morning but eventually ran out of gas in their fifth game of the weekend against a team that featured as many Division I commits as Minnesota had on its entire bench. The score was 3-0 in the first five minutes of the game, as Team Texas eased to a 10-0 victory and the national crown. But nobody wants a Team Texas sweater. There wasn’t a member of the tournament staff, any of the athletic trainers or a single rink employee who wasn’t rooting for Minnesota, Miller said, and someone went so far as to ask for a team jersey. The teams representing Alaska and Montana joined the chorus of support, packing the bleachers for the final game and cheering for Minnesota. Regardless of the final score, Minnesota came out on top, Rokala said. “We won that game. That’s what we were all saying,” Rokala said conclusively.